Kerry are flying high in the top tier but the other Munster counties are struggling. It's a key weekend for Cork, Clare and Tipperary. AFTER THE MIDWAY mark in spring, the football league begins to settle into a shape. Judgements made for the season ahead cannot yet be cast-iron but a sense does emerge as to what directions teams may be heading. A glance at the top two divisions ahead of round five fixtures paints a contrasting picture for those that will line up on the Munster starting grid this summer. In the leading tier of the football league Kerry have an unblemished record as they have emerged as the early pace-setters, putting distance between themselves and second-placed Mayo last weekend. In the second level it is Clare, Tipperary and Cork that fill the bottom three positions. In the basement division Limerick are fourth and Waterford are seventh, promotion a prospect that looks set to be confirmed as out of their reach with Derry and Leitrim bossing that particular race. Kerry have four victories from their four league assignments to date in 2019, the other five Munster counties have a combined total of five after all playing four rounds of action. It is a sharp difference in form with Waterford only picking up a first victory last Sunday and Cork still searching for a result that will bump up their win column. The ascension of Kerry to the summit may not surprise nor the fact that Limerick and Waterford are stuck in Division 4. But it is the trio of sides in Division 2 where the real intrigue lies as Tipperary entertain Cork tonight and Clare travel to face Fermanagh tomorrow afternoon. At the moment it can be regarded misleading to stick Clare and Tipperary in a relegation battle. They’re sixth and seventh, Clare edging out Tipperary on scoring difference at present, and both are only two points off Kildare in third place. A victory for either this weekend alters their path forward. For Cork the situation is more stark with a single point on the board after four outings. Fail to triumph against Tipperary, the team directly above them, and the prospect of reeling in higher teams to avoid a fall through the relegation trapdoor seems remote. A win for Cork would provide a timely boost while simultaneously dragging Tipperary down and applying pressure on Clare who are trekking to Enniskillen to face a team that are joint top of the table. Post-mortems in Cork football have become frequent occurrences in recent years. The broader issues in the largest county in the country were explored in the five-year plan mapped out in early January but that needs to be untangled from the current side’s form. Ronan McCarthy takes his Cork team to Thurles tonight. Since contesting the Division 1 league decider in 2015, Cork have been struggling to gain footing in the league. They’ve played 25 matches since then over four campaigns with eight wins, four draws and 13 defeats posted. As a metric to evaluate their record, consider that represents 20 points from a possible 50. Relegation from Division 1 in 2016 was followed by fourth (2017) and sixth (2018) place finishes in Division 2. It’s been a constant spring slide with player and coaching turnover contributing to instability. The last two ties saw convincing losses to Clare and Meath but there were big opportunities missed before then. A 14-man side were a point up away to Fermanagh on the opening day when they spurned a clear scoring chance, coughed up possession from a free and fell foul of a dubious referee call over the new mark rule in three successive passages of play. In the second round against Kildare, Cork were motoring well after half-time with Michael Hurley inspiring them to draw level. A man up after Fergal Conway’s dismissal and with the impetus seemingly to push on, they could not elevate their display with a more measured and seasoned Kildare side wearing them down for a three-point victory. The pressure has heaped on since. Cork have the third lowest scoring total compiled across the four divisions. Donncha O’Connor and Colm O’Neill could not be expected to keep ploughing away indefinitely but their retirements last summer have filled a void that has yet to be filled through personnel or an offensive system. O’Neill’s input is best captured by the fact he struck 1-6 in a 2018 league victory against Meath, a team Cork in total only hit for 1-9 in defeat last Saturday week. Last year’s league largely brought happy and progressive experiences for Clare and Tipperary. It’s only five years since they faced each other in a Division 4 final. Clare lifted silverware in a Division 3 decider in 2016 and Tipperary emulated them twelve months later. In 2018 Clare finished third in the Division 2 rankings while Tipperary were only denied promotion by a Cavan team that pipped them by a point in a last round clash. Clearly the two teams have been travelling on an upward curve and both have sampled Croke Park championship fare in the last three seasons but it has not been a smooth start to 2019. Clare’s case is curious in that they were impressively dominant in their win over Cork, showed resolve to dig out a draw against Armagh and their losses were to a pair of teams, Donegal and Kildare, that could be regarded as amongst the elite after their Super 8s participation last summer. The experienced trio of Gordon Kelly, Gary Brennan and David Tubridy continue to spearhead their challenge, they have Eoin Cleary back fit in attack and Jamie Malone pitched in with a valuable 0-5 haul against Kildare last Sunday. But the fixture list looks trickier now. They may have already faced the pre-league promotion favourites yet the way it has panned out, Clare now find themselves pitted next against two teams who are leading the charge to make the jump to Division 1. Fermanagh and Meath will not lack motivation. Suddenly Clare are realising just how ferociously competitive the division is. In the case of Tipperary they can point, in mitigation about their current situation, to a catalogue of injuries that have hampered their squad. Michael Quinlivan, Robbie Kiely and Bill Maher alone are a triumvirate that apply stardust to the side when they are on the pitch. Established goalkeeper Evan Comerford is also absent while they lost Paul Maher and Kevin O’Halloran last week to add to a growing list. The clearance of Brian Fox’s red card will be viewed as a necessary boost by Liam Kearns. They enjoyed a rousing win over Donegal after a draw with Fermanagh where they had coughed up a victory. That was the home form and the away days have seen them in arrears to Armagh and Meath. The bottom line is a clear requirement for points this weekend. 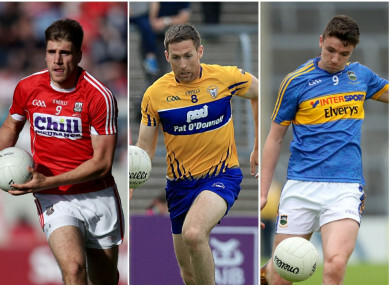 That outcome is essential to Cork’s hopes of survival, losses won’t be as severe a blow for Tipperary or Clare but it will plunge them into a difficult battle for safety with two rounds remaining. The stakes are high and the desire for security is great. Casting a wider view it all adds up to a situation in Munster that is less than promising. In the league Kerry chase a five-in-a-row of wins tomorrow at Fitzgerald Stadium. In the summer they will chase a seven-in-a-row of titles in their home province. And right now it looks like it will take quite a rate of improvement from one of their challengers to stop them. Email “Battling the drop - Division 2 form a concern in the greater Munster football picture ”. Feedback on “Battling the drop - Division 2 form a concern in the greater Munster football picture ”.